The Ultimate Digital Sports Awards 2011 was recently won by RugbyWorldCup.com. 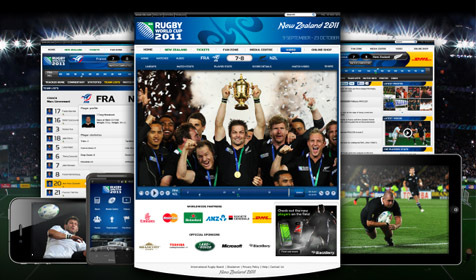 The International Rugby Board (IRB) web site won this exciting sports technology award given by SportsBusiness with the sportsbiz help of Rugby New Zealand 2011, deltatre and IMG. Fans clicked on over 350 million pages and viewed 17 million video views on the official App during the 48 games of the RWC 2011 yet their social media team still found the time to tweet every so often with @sportstechieNET which made our Sports Techie day from half way around the world here in Seattle. Thank you. The IRB and deltatre have worked together since 2007 and as a result they were well prepared to meet this digital surge of old and new rugby sport fans head on with innovative Social Media driven technology offerings. Deltatre manages the IRB digital media platform. As the IRB’s commercial partners, IMG were responsible for rights negotiations and sponsorship components. For the IRB, their intention was to promote rugby on the global scale and have as many people as possible engaging with the tournament by offering fans a comprehensive online digital content bundle for free. The IRB tournament’s multi-platform digital package, included website, social media, App and digital daily highlights. This sportsbiz model was also voted the best event strategy for 2011. Rugby fans connected to the event via the high-end website, mobile website, mobile apps (IOS, Android, BlackBerry and Playbook, Windows 7), tablet apps (IOS, RIM) plus communicationed via Social Media (Facebook, Twitter, YouTube, Flickr) on a 25/8 basis. What became transparent to the IRB was the fact that page impressions on the official mobile platforms outnumbered the website by a three to one ratio. No doubt this trend was fueled by the emergence of more global smartphone and tablets users. 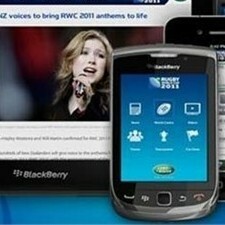 Over 3 million app downloads happened during the RWC 2011. The iPhone was the most downloaded version of the application, with video and live match scoring being the most viewed content. “The website was extremely popular, but what struck us most was that consumers from more than 200 countries and territories used the mobile applications from the 4 major mobile platforms, which may be a first in the history of mobile sports,” said Paul Bristow, Managing Director – deltatre media. Sports Digital Media is what deltatre is all about. They provide operational, technology and consulting services for digital media, broadcast, results, TV graphics and sport business processes. Deltatre works with leading sports federations and broadcasters. Solutions for smartphones, tablets and Connected TV are all part of the deltatre standard digital media offering. Deltatre is global, with employees in Torino, London, Manchester, Lausanne, Paris, New York and Portland. They support Rugbyworldcup.com, IRB.com, FIFA.com, UEFA.com, Europeantour.com, NBCOlympics.com, CTVOlympics.ca, BBC.co.uk/Olympics and many others clients. Several of my past Sports Techie blogs highlight their sports tech prowness. Deltatre has been the ‘Ultimate Sports Website Award’ techie glue for other winning clients such as FIFA for the 2010 FIFA World Cup website and UEFA for the UEFA Euro 2008 website. No other sports business has won this SportsBusiness award other than deltatre. Their infrastructure is designed in a way that allows clients to scale up (and down) according to their event schedules. Deltatre use Content Delivery Networks (CDN) to assist with delivery, ensuring that regardless of where people are based, they get a consistent user experience. Deltatre’s products and solutions are localized in multiple languages. Solutions which offer the highest quality and most engaging way to view live and on-demand video footage are what deltatre continues to deliver, for a quarter of a century. Deltatre also worked closely with two technology sponsors of the Rugby World Cup: Microsoft (from my hometown of Redmond), and their Smooth Streaming, and Research In Motion (RIM) who provided technical support for the BlackBerry smartphone apps. As a result, more than five million video clips have been viewed on the official tournament website at rugbyworldcup.com with 120 million page impressions generated. There are over 1.4 million fans of the official RWC Facebook page. Since its inception in 2007, RWC on Youtube has nearly 300,000 channel views, over 5 million total upload views, and 7,792 subscribers. ‘Ask Buck’ by MasterCard is a website marketing campaign that has a clip near the end of the video about the Haka. The Haka is a Māori people challenge war dance that the RWC 2011 Champions All Blacks of New Zealand perform and truly captures what the game is all about, being your authentic self. Thanks to deltatre for helping to bring these real world interactive sports experiences and streamed rugby images to our homes, cars, and even vacations, for the digital billions all over the planet.